Interactive Map of India for WordPress Website. Get it for free. What are the features of the Plugin? Option to Create Macro Regions: You can group a bunch of states together to create a macro-region. This option will be very helpful to businesses. Clickable States: Each state shown on the map can be clicked. You can either set a hyperlink or other actions. Mouse Over Actions: You can allow popup tooltips to show up when hovering the mouse over a particular region. Customization: You can customize different regions with different colors. Responsive design: The maps boast a responsive design. This means they are mobile-friendly and will adjust its size if viewed from a small-screen device. No Flash: Instead of the vulnerable Flash, the plugin uses HTML5 for better security and reliability. Supports Shortcode: The maps can be integrated into your site’s post and pages by using shortcodes. The feature-rich interactive Indian map plugin can be used for a whole variety of purposes. Not only can you customize it, to fit your needs, but there are also options to add extra features to make it more informative and engaging to your users. With color customization options, the companies can highlight all the states where they are conducting their business. Each of the states can be configured to perform an action on clicking and can be redirected to a different page. This makes it excellent for on-site navigation as well. The developers over at Fla-shop.com are currently running a limited period offer where they are giving away this awesome maps plugin for free. 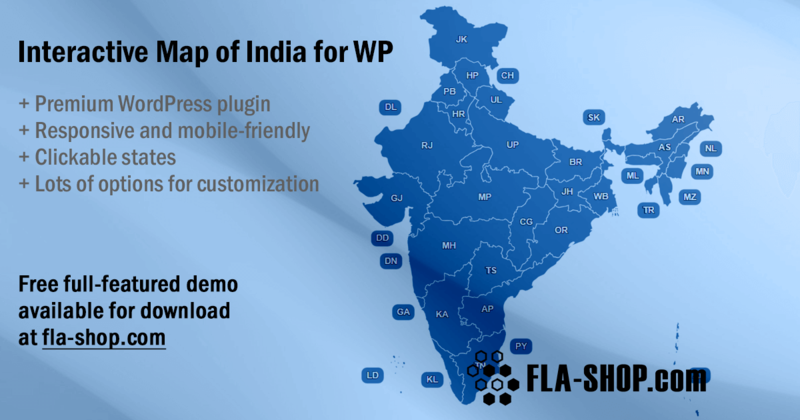 The interactive Map of India for WordPress plugin, which otherwise costs $49, will be yours if you follow these simple steps. All you have to do is write a review for the plugin, and attach a CTA (Call To Action) link to product page. Now there are some requirements you must follow to make your review legible. You need to have a blog where you will need to post the review. The review needs to be in fluent English. The text needs to be a minimum of 500 words. The review needs to be unique and should not be plagiarised / a copy of another blog post. You need to include at least one screenshot of the plugin. As you can see, installing an interactive map on your site can help you improve your business. And on top of that, with Fla-shop.com’s offer, you can get this awesome premium plugin for free.